Abstract. In this work we develop a reduced-complexity model (RCM) for river delta formation (referred to as DeltaRCM in the following). It is a rule-based cellular morphodynamic model, in contrast to reductionist models based on detailed computational fluid dynamics. The basic framework of this model (DeltaRCM) consists of stochastic parcel-based cellular routing schemes for water and sediment and a set of phenomenological rules for sediment deposition and erosion. The outputs of the model include a depth-averaged flow field, water surface elevation and bed topography that evolve in time. 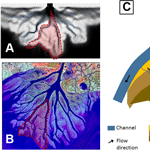 Results show that DeltaRCM is able (1) to resolve a wide range of channel dynamics – including elongation, bifurcation, avulsion and migration – and (2) to produce a variety of deltas such as alluvial fan deltas and deltas with multiple orders of bifurcations. We also demonstrate a simple stratigraphy recording component which tracks the distribution of coarse and fine materials and the age of the deposits. Essential processes that must be included in reduced-complexity delta models include a depth-averaged flow field that guides sediment transport a nontrivial water surface profile that accounts for backwater effects at least in the main channels, both bedload and suspended sediment transport, and topographic steering of sediment transport. 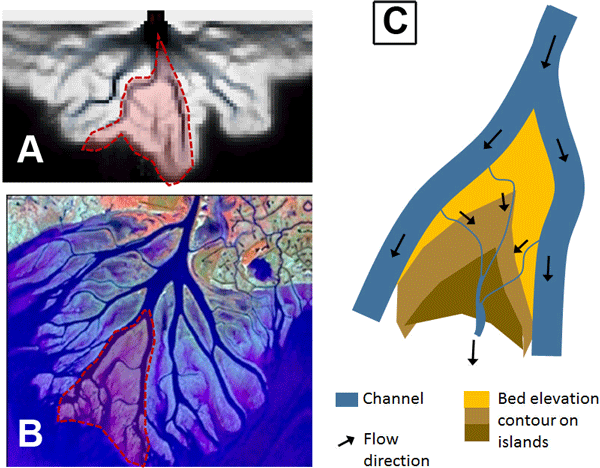 How to cite: Liang, M., Voller, V. R., and Paola, C.: A reduced-complexity model for river delta formation – Part 1: Modeling deltas with channel dynamics, Earth Surf. Dynam., 3, 67-86, https://doi.org/10.5194/esurf-3-67-2015, 2015.